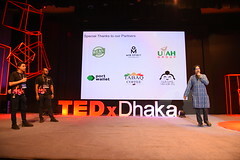 Session 3 of TEDxDhaka featured talks about tackling child labor, physical abuse in the form of acid attacks, mental illness, child mortality and, a little off-topic, beatboxing. 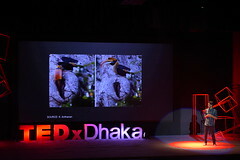 The talks from this session focused on the body and the mind. Our first speaker during Session 3 was Nina Smith, Executive Director of GoodWeave International. Smith narrated the story behind the intricately designed rug she was standing on, which was handmade in Kathmandu and was comprised of over 500,000 individual knots. “I love hand made things; I always have,” said Smith. Unfortunately, handmade goods can also have a dark side. Sanju, an 11-year-old from Nepal, was stolen from her home and taken to a weaving facility far away. She was forced to work day and night, in inhumane conditions. Deprived of her childhood, Sanju was trapped until GoodWeave, an organization working to eradicate child labor in the rug weaving industry, found her. Stories like these are widespread in South Asia and around the world. “The only thing modern about modern slavery is that it is happening now,” Smith continued. Smith invited everyone to look beyond these handmade goods to realize the struggles behind them. Initiatives like Goodweave give a market-based solution to a global problem. GoodWeave works to raise awareness and promotes ethically made carpets that are not the product of child labor or slavery. A GoodWeave label indicates that the rug is made ethically. Check before you buy! By making the market-driven system more popular, Smith reiterated the possibility of eradicating child labor from the rug industry by 2020. Already, GoodWeave has reduced child labor in South Asia by 75%. “May it be by our order that they gain freedom” Smith said. 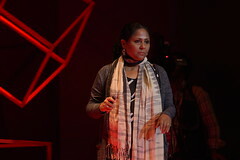 Our second speaker after lunch was Monira Rahman, the first executive director of the Acid Survivors Foundation. 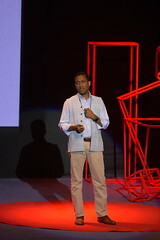 According to Rahman, between 1999 and 2013, over 3000 people were attacked with acid in Bangladesh. A majority of these victims were women, but children, and to a small extent men, were also attacked. Acid attacks are mostly driven by money, property gain, or vengeance over failed love proposals. 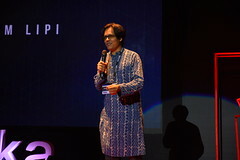 Rahman started working as the first executive director of the Acid Survivors Foundation in 1999 to tackle this social problem. The organization provides education to acid attack victims about emergency treatment and implements programs to prevent acid attacks in future. The Acid Survivors Foundation involves communities, activists, victims, and doctors to help stop this violence. 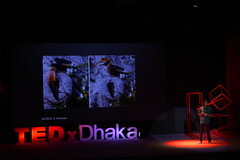 During her talk, Rahman shared outstanding stories of courage and bravery. Nila, a 15-year-old girl was married off to a man working overseas. She was a skilled dancer and was very beautiful. However, her husband was jealous that she might look at other men and threw acid on her face to destroy her beauty. 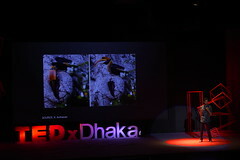 “What if you looked in the mirror and did not recognize yourself?” Rahman asked. Now, the Acid Control Act (2002) and Acid Crime Control Act (2002) exist to help convict perpetrators. Unfortunately, because the majority of attacks are carried out by people victims know or love, the conviction rate is extremely low. The Acid Survivors Foundation’s relentless efforts to prevent acid attacks have helped reduce the number of such attacks to less than 100 in 2013. “We want to shut down the Acid Survivors Foundation because we do not want acid attacks to take place in Bangladesh,” Monira declared. Well known beatboxer Shanto was next in our line up. “Life starts with a beat,” he began. According to Shanto, beats are natural. Even a heart has a beat. People begin making sounds from a young age, when crashing toy cars and playing with dolls. Shanto encouraged everyone to ignore people who call others weird, awkward or stupid because they do things in a different way. He spent the bulk of his presentation showing off his beatboxing skills, looping one beat on top of another. Our next speaker, Anisul Karim, is a researcher with the Transform Nutrition Consortium. The reasons behind child mortality and maternal ill health, two of the Millennium Development Goals set by the United Nations, are interestingly simple, according to Karim. Historical data shows that women who are educated experience reduced child mortality rates and improved maternal health. Studies have shown that Bangladesh has the fastest prolonged reductions in childhood stunting in recorded history. Bangladesh surpasses Pakistan and India, even after spending less on public health. So what did Bangladesh do right that neighbouring countries did not? A female secondary school stipend program launched in 1990 made all the difference. 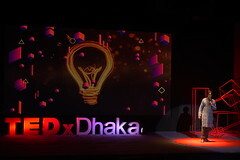 The program was so successful that Bangladesh women now surpasses men in secondary education. 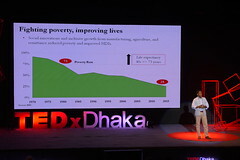 Karim warns us that Bangladesh’s current rate of child mortality (41%) is still high. Bangladesh is still one of the bottom 10 countries in the world in this regard. “We need a paradigm shift…we need an approach that is holistic,” explains Anisul, referring to his diagram of a 360 degree nutrition scheme. 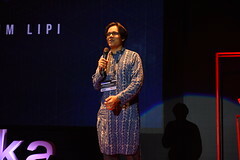 Our final speaker from Session 3 was Tanzeem Choudhury, director of the People-Aware Computing group. “How many of you have taken care of or supported a person with cancer? With a heart disease? 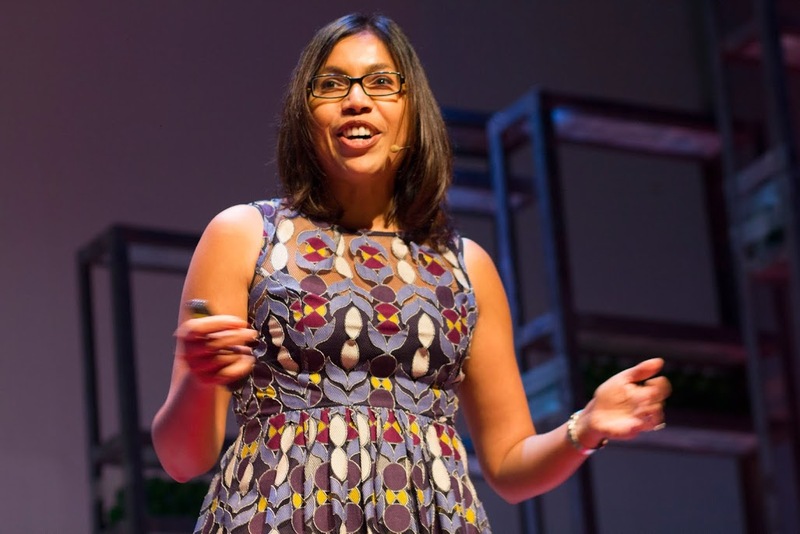 With a mental illness?” Tanzeem Choudhury asked. Around 1 in 6 people suffer from mental illness. Signs of mental illness include unusual sleeping patterns and behavioral factors like the pace at which we speak and how we walk. Amazingly, people look at their phones 100-150 times per day. This gives researchers the opportunity to use technology as an early indicator that something might be happening to a person’s mental health being. However, even with technological support, treating mental illness is multidimensional and requires social participation. 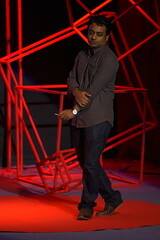 Tanzeem reminded the audience that there is nothing to be ashamed in regards to depression.